6 January 2019 | Iberia A350 business class long haul – better than BA? 30 December 2018 | British Airways First B777 to Shanghai review – how did it compare to Paul’s controversial report? Whilst Turning Left for Less generally concentrates on Business and First Class travel, there are times when it is just not worth the money to travel in Business class on European flights. After the introduction of BA’s buy on board in short haul economy, there is really very little to choose between BA and some of the low cost carriers, unless you have BA status with lounge access or particularly need the tier points or Avios. I needed to fly to Palma recently, but BA wanted a ridiculous £400 for economy and nearly £700 for Club Europe. Bearing in mind that this was not school holidays and mid week, that seemed ridiculous. Add in the 6am start at Heathrow and it was enough for me to take my business elsewhere. Up until recently my second choice would have been Flybe, as they are generally pretty good and fly from my local airport. They have now switched several longer flights to turbo prop Dash 8 aircraft. After 3 hours flying to Spain next to a noisy propeller last year, I decided not to do that again. I haven’t travelled on easyJet for a few years, but they had a decent fare and the flights timings were very civilised with a 12.10 departure from Gatwick. With an ‘Up Front’ seat which included the front row bulkhead seats, 20kg luggage each, 2 pieces of hand luggage and speedy boarding/priority check in, it was much cheaper than BA at around £250. So how does it compare to BA? 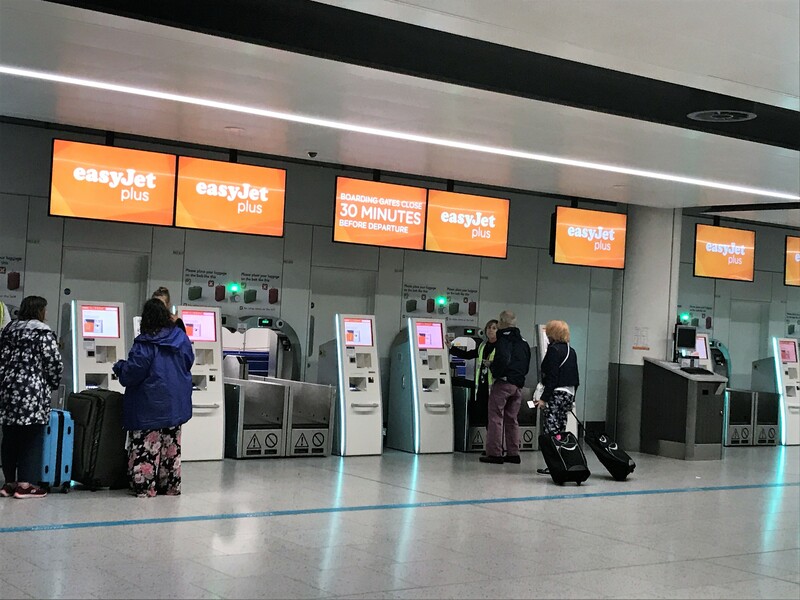 Obviously I had priority check in, so it is not a totally fair comparison, but if I compare the easyJet automated check in to BA’s at Heathrow, there is no discernible difference. I reviewed BA’s new automated bag drop here. There was no queue and plenty of free desks available when I arrived at easyJet’s check in. The whole process was extremely simple and quick. You simply scanned your boarding pass, put your bag on the scales, attached the label printed out and then sent the bag on its way. I used the No 1 Traveller lounge with Lounge Buddy which I will review separately. easyJet appeared not to be using jet bridges at Gatwick. I am guessing this is to do with a) cost cutting as airports charge for jet bridges, b) quick turnaround as with steps you can use 2 doors. Despite last call announcements being made for the flight at the standard time, we were pretty late boarding. The crew had only arrived about 15 minutes prior to the scheduled departure time and there was no aircraft there! When they eventually started boarding it was an absolute shambles, but it only got worse as it went on. They announced speedy boarding first but had no separate queue or barriers. As people tend to stand around the boarding area, no one could tell who was actually boarding and you just had to try to push your way through all the other people. We then shuffled down the steps at a snail’s pace and found ourselves standing out on the tarmac with many other passengers. Bearing in mind that this was during the bad weather we had about a week ago, it was absolutely freezing. Young children were visibly cold, as we stood there for at least 15 minutes. You can say what you want about BA, but that is something I have never experienced with them and in general they use air bridges in the UK. We were seated in row 1 E and F. The legroom was pretty much the same as row 1 in Club Europe on the A319/320. It felt about the same as the BA exit row but it is hard to tell exactly. The seats were the slimline style that most airlines have currently in short haul economy. 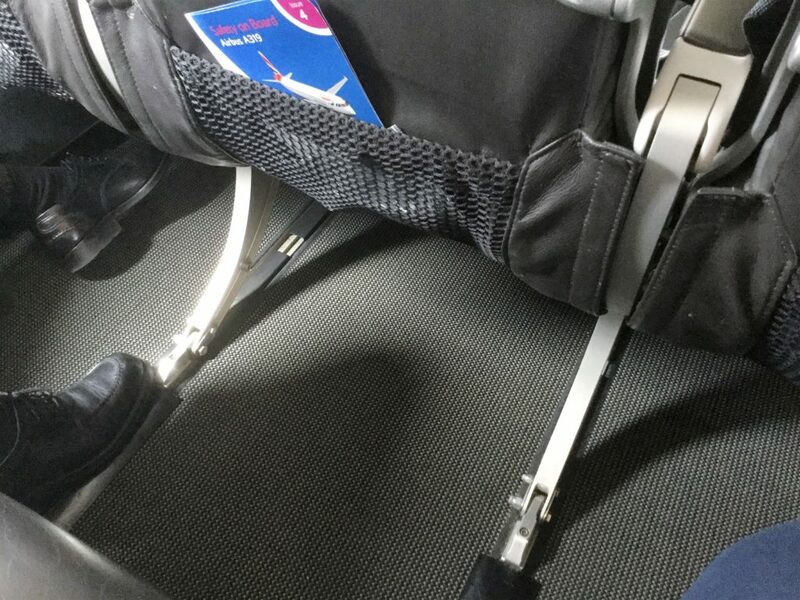 Interestingly the seat width was 18″ versus 17″ on some of BA’s short haul aircraft. I found the seats perfectly comfortable for a short flight. 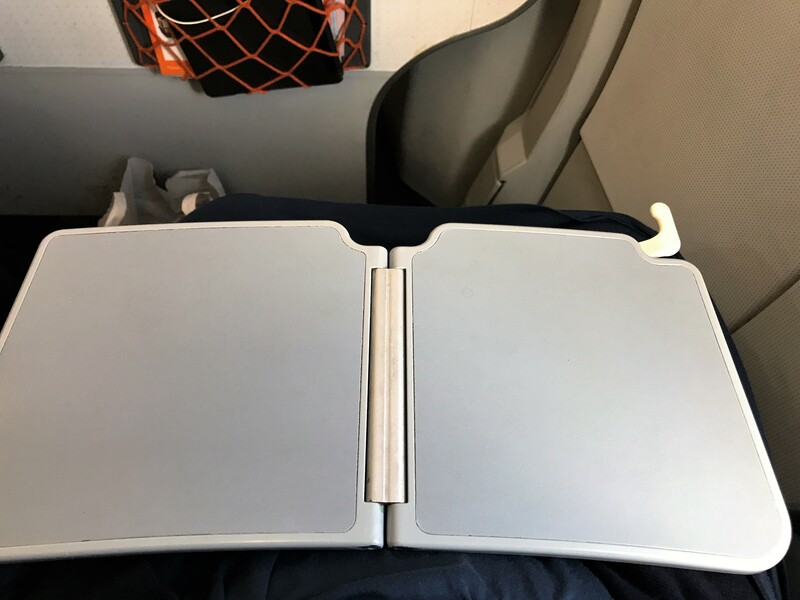 The only thing I didn’t like was the tray table which came out from the arm rest. This was absolutely minute and BA’s ones are definitely better.You could not have done work on even a small laptop on this table. 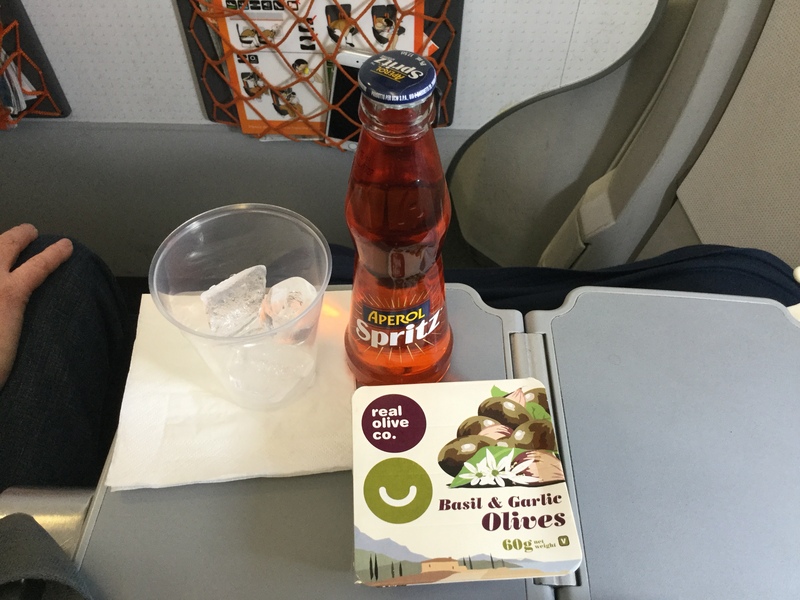 I was pleasantly surprised by the food and drink available to buy on board. It was far more sophisticated than I expected and there was a wide selection of appetising looking food and drink. They had quite a few hot sandwiches such as a croque monsieur and a focaccia caprese. There was also a bacon roll which BA do as well. Prices were very similar to BA’s M&S sandwiches at around £4.50 for a sandwich. 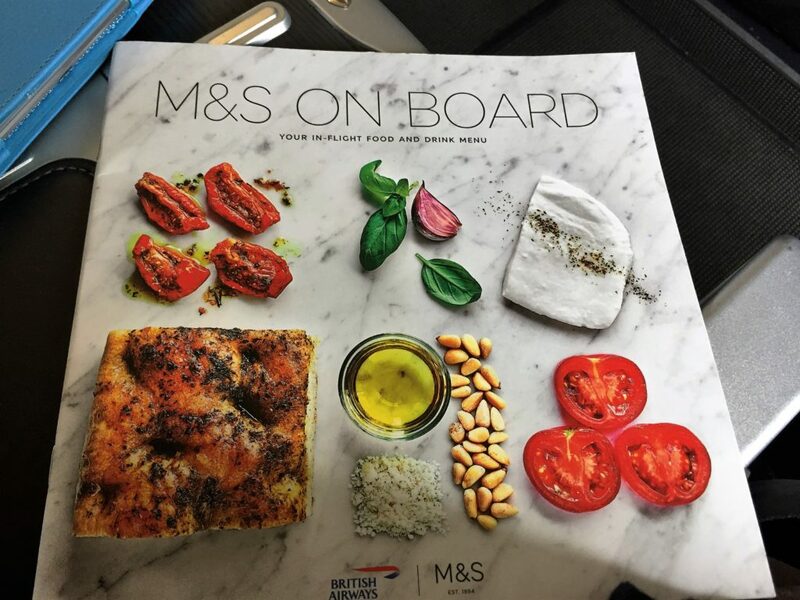 You can find more on BA buy on board in this article. Overall I thought the EasyJet section was more varied, I find the BA one a little dull. You could tell the crew were well versed in the service. They were so efficient they even came round a second time to offer more items for purchase on a pretty full flight. The flight time was also pretty short at 1 hour 45 minutes. BA seem to struggle to even get round once! I enjoyed an Aperol Spritz at £4.50 and some olives. If you are a gin fan, they even had Hendricks at £6 a double measure and Fever Tree tonic. 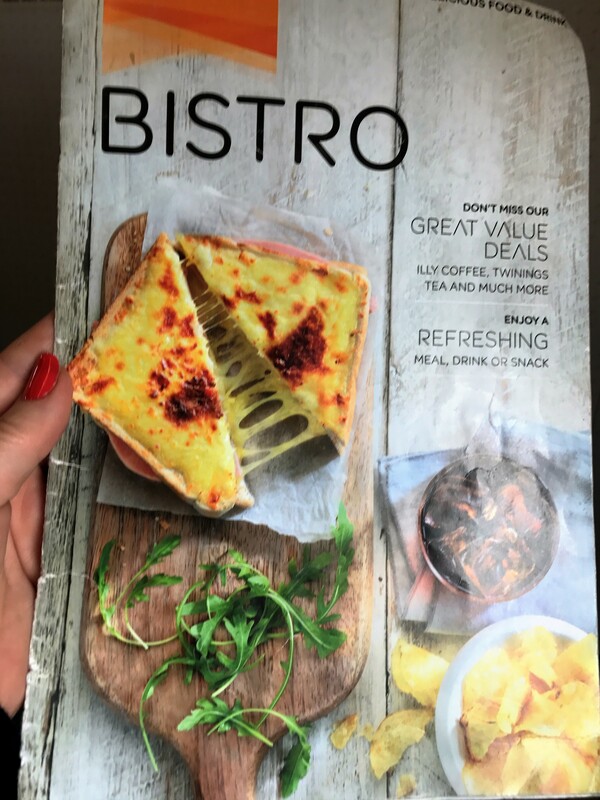 You can see the full menu here. Winner: easyJet – the food selection was more sophisticated and the service much faster. All customers can take 1 cabin bag on board. There’s no weight limit but you must be able to lift it into the overhead locker. 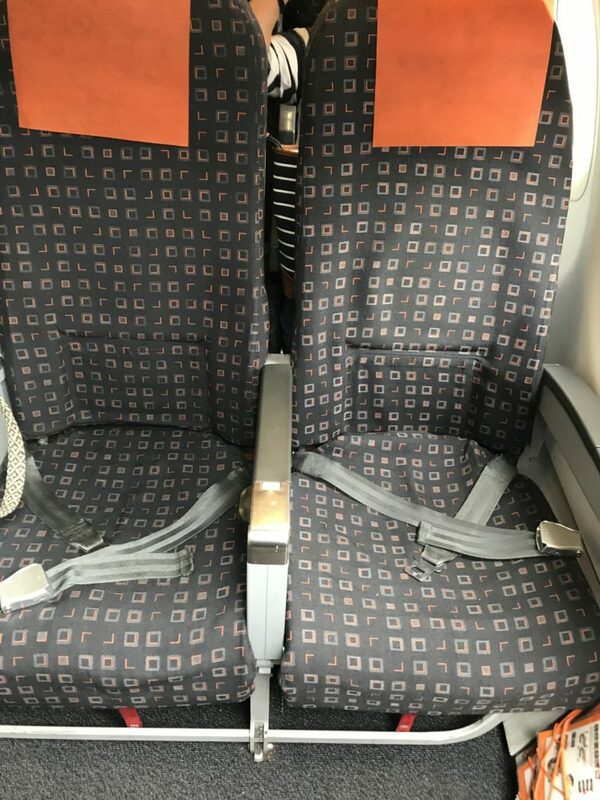 You can bring an additional under seat bag if you’re an easyJet Plus cardholder, FLEXI fare, Up Front or Extra Legroom customer, or if you’re travelling with an infant (under 2) on your lap. Maximum size 56x45x25cm (including handles and wheels). Luggage costs extra, with 20kg included in the Up Front fare. You can buy up to 3 bags at 20kg each but also purchase extra weight allowance in 3kg increments. You can take 2 items of hand luggage onto the aircraft. BA has a maximum main hand luggage allowance size of 56cm by 45cm by 25cm. You are then also allowed a laptop or handbag or briefcase that will fit under the seat in front. Except on basic fares, you can take 1 bag at 23kg for free as checked luggage in economy on European flights. A tie! Both services had deficiencies but in different areas. The overall easyJet experience was better than I expected. If they could fix their boarding procedures, easyJet would have been a clear winner but this made an unpleasant start to the trip. 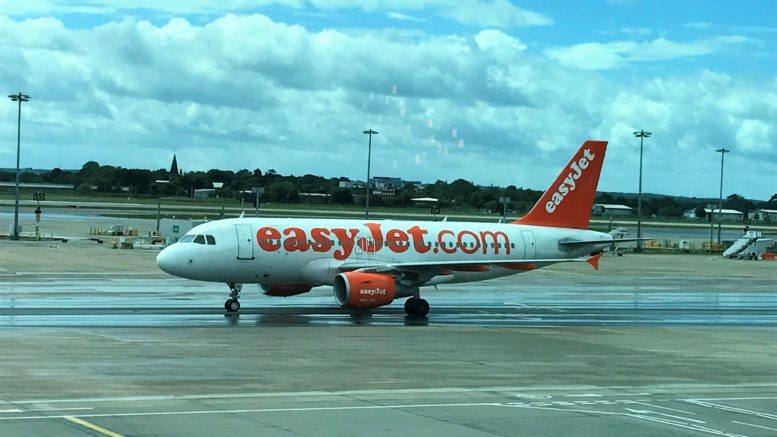 If you do book an easyJet flight, make sure you book direct with easyJet as they do charge if you book through an on line travel agent such as Expedia. This is something that BA will also start doing in November. 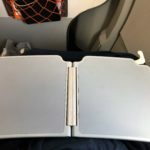 2 Comments on "easyJet flights versus BA review"
I travel with easyjet a fair amount and i have never had an experience like yours. I suggest you try them again as you must of had them on a rare bad day. I always find their priority boarding excellent and very worthwhile….. Thanks. I am flying back with them tomorrow so it will be interesting to see what it is like then. Enter your email address to subscribe to this blog and receive the latest post every morning. What should you pay for your business class flight?